Well I have fallen victim to the nasty bug everyone has this winter. And, like most times, I love to people watch, even at the walk-in clinic. So there I was, in very bad humor, driving up to the clinic while coughing up a lung. A few irritating people were there in front of me (What?! The clinic opens at noon! How rude to show up early). So I swung my big rumpus out of the car, and the guy in front of me held the door open. What a nice person! He was obviously sick, too, and I couldn’t believe how thoughtful he was. Because, let me tell you, I wasn’t holding the door for anybody! He shocked me further by offering to let me get in line in front of him! As much as I would love to think it’s because he found me hot, my watery eyes and red nose just won’t let me believe that. I was tempted, but declined the offer with a polite ‘after you’. It about killed me. In my purple mask. I look a mess, but my eggplant snood is cute. #1: Boys are silly. You would think after nice dude held the door open for me I’d be more gracious, but I’m merciless when I don’t feel well. 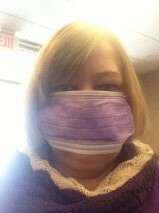 Each woman in line donned a surgical mask as soon as they walked in. The 3 guys went bare-faced. I say REALLY? Now is the time to be macho? You are not winning against THE FLU! You are in a room with germs galore and people coughing so much it sounds like a hacking symphony, and you are too cool to wear a mask. Even the door opening guy was guilty. Happy flu to you in a few days, ya big doofuses. #2: Well, there was going to be a second observation, but I got called back into one of the little rooms and, in my giddiness to receive antibiotics, I lost my train of thought. I am sick, after all. Give me a break!